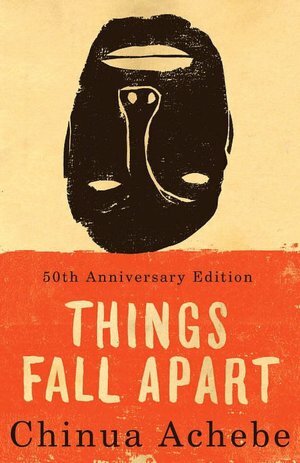 Synopsis [c/o Barnes & Noble]: "Things Fall Apart tells two intertwining stories, both centering on Okonkwo, a “strong man” of an Ibo village in Nigeria. The first, a powerful fable of the immemorial conflict between the individual and society, traces Okonkwo’s fall from grace with the tribal world. The second, as modern as the first is ancient, concerns the clash of cultures and the destruction of Okonkwo's world with the arrival of aggressive European missionaries. These perfectly harmonized twin dramas are informed by an awareness capable of encompassing at once the life of nature, human history, and the mysterious compulsions of the soul. A classic of modern African writing, this is the tale of what happens to tribal customs and old ways when white man comes." Overview: I was required to read this novel for an online class this past spring, and as I usually do when reading class novels, I fell in love. This isn't the type of book I would normally pick up, but after reading it, the storyline and messages relayed by the author are amazing. Following the life of the main character, Okonkwo, we see as he visualizes a very successful future in his village, and works to attain it. However, after an unfortunate incident, he is exiled from his village for a number of years, forced to live among relatives in another town in the lowest position in society. Once he is able to return to his village, he once again seeks to attain greatness, but the arrival of white European missionaries halts good intentions, and "things fall apart." A very in depth look at how religious emissaries from wealthy nations attempt to reform African society and culture, pitting brother against brother and sister against sister, renovating their ideals of religion and confusing tradition. Okonkwo is unable to watch his fellow countrymen be degraded, and hangs his head in shame. As a fan of historical novels, especially those concerning European conquests, this novel was a great look into yet another overtake of the white man's ideals, no matter how negatively they would impact the surrounding economy. Written in traditional African cadence, it's mesmerizing, intriguing, and a fantastic learning experience.